The 'Add contact to shortlist' button has been updated. Instead of going straight to the form to create a new contact, it will now open a popup modal which allows you to select an existing contact to add to the shortlist. It is still possible to create a new contact and add it to the shortlist by clicking the 'Create new contact' button. A profile/description icon has been added following the contact's name. Clicking on the icon will open a popup modal containing the contact's profile/description. In the future we plan to expand this functionality to contain more information and to enable this for more types of records. 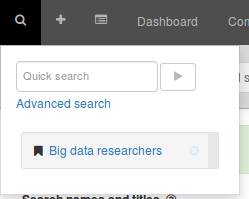 Bookmarking a search, will now save the full search, including all fields, filters, sorting and page you're on. When bookmarking, you will be prompted a popup modal to name your bookmark to easily identify your bookmarked search. The created bookmark will be available in the Quicksearch window when clicking the spyglass icon on the top left. 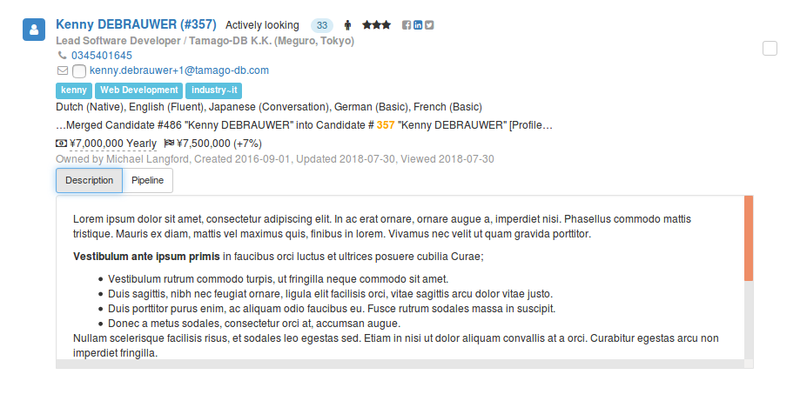 Search results in Advanced Search now have a 'Description' (when available) and a 'Pipeline' button which will slide open a box containing the record's description/profile and the pipeline. A customizable 'type' field has been added to Visa. The options can be added under 'Customization' in 'Administration'.